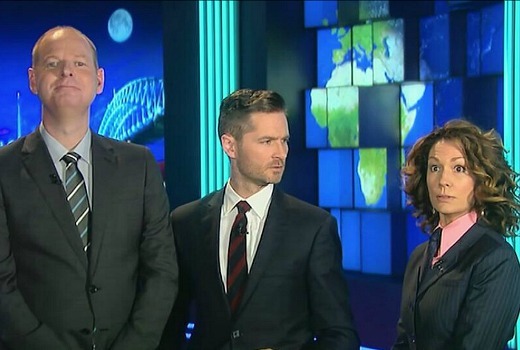 ABC has renewed The Weekly with Charlie Pickering for a second season, and confirmed an end of year special Pickering flagged in his season finale, to be called The Yearly. Tom Gleeson and Kitty Flanagan will both return with Pickering. “The team at The Weekly is currently on an extended hiatus from screen duties. Our priority has been expending much-needed time and development funding coming up with a name for the one-hour annual news roundup special. After a laborious three minutes, we settled on The Yearly and will be taking the rest of the time off. See you in December,” said Pickering. The Yearly will put an arm around the shoulder of 2015, gently take it aside and ask it to take a long hard look at itself. Charlie, Tom Gleeson and Kitty Flanagan, along with The Weekly’s global correspondents, will make sense, and make light, of an extraordinary year of change, upheaval and ridiculous breakfast television clips that no family can afford to miss. The news comedy show that Australia has ended up with will be back on our screens in February to again cut through the white noise of news, identifying this country’s hypocrisies and absurdities and finding new ways to laugh through the tears. Charlie will again be flanked by two of Australia’s best loved comedians Tom Gleeson and Kitty Flanagan, who would have been rapt to return even if they weren’t contractually obliged to do so. The Yearly will premiere in December on ABC. I tried watching this show once, but the spectacularly annoying and unfunny Tom Gleeson and Kitty Flanagan ruin it for me. As the others note, Mad as Hell and Reality Check are much better. Good news, quite enjoyed that show and it did get better as it went on. Definitely worth renewing. The show got better as the weeks went on. I still think Tom and Kitty’s segments were the funniest parts though. You must be kidding!! All that phony laughter and applause track over the top of the unfunny dialogue. Talk about lame….it was not funny . Mad As Hell was far superior as was Reality Check. Guess I will have to watch other channels at that time next year. Having sat in the audience the laugh track suggestion is a bit surprising. Mad as Hell is confirmed for a 2016 return which I have published before. Your comment lost all credibility once ‘Reality Check’ was mentioned. I only watched the first episode and that was more than enough for me. I’d rather see Reality Check with Tom Ballard get a second season than The Weekly. This is great news – took a couple of weeks to find its feet, but it went on to become my favourite new show of the year so far. This is good news, I loved this show, specially Tom Gleeson’s spot. Very funny. I don’t know how they’ll top the coffee-cup one-upmanship routine, that was a ripper. I was underwhelmed by the show personally. If prefer Mad As Hell to get a longer run instead!